Cellist Marcy Rosen presents three rarities in an irresistible recital disc, including sonatas by Ludwig Thuille, Sir Donald Francis Tovey and Ernst von Dohnanyi (Bridge 9264). All three date from the turn of the 20th Century and all are steeped in late 19th-Century romanticism. For me, the biggest discovery is Tovey's inventive Sonata for Two Cellos in G Major, whose three movements flow effortlessly from sunny lyricism suggesting Brahms in a good mood to variations on Catalan folk songs and a closing whirl of Bach-inspired counterpoint. I guess it was not enough that the English-born Tovey (1875-1940) should be one of the greatest musicologists and music critics in history; he also had to be a talented composer. Show-off. Rosen's sound is rich and warm, all the way from the basement of the cello to the balcony, and she has a tasteful way of lingering over a phrase without preening. 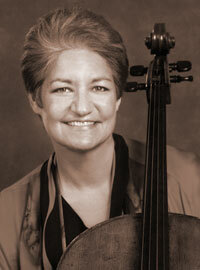 She partners with the excellent pianist Lydia Artymiw and, on Tovey's Sonata, cellist Frances Rowell. nostalgia that suffuses so much of Dohnanyi's music. The curiosities are a Cello Sonata by Ludwig Thuille (1861-1907) and a Sonata for Two Cellos by Donald Francis Tovey (1875-1940). Whether it's the first recording, it is certainly the first I ever heard of the music itself. The performance, in which Marcy Rosen is joined by Frances Rowell, gets the scale of the 20-minute musical gambol perfectly, loving and gently expansive. The Andante middle movement, a tribute to Casals, consists of variations on a Catalan folk song. The last movement, an entertaining contrapuntal game, pays delicious homage to Bach.